One of the ways our expert in-house investment team make your money do more is by partnering with eight world class fund managers. These are some of the biggest names in investing, and you’ll have more than likely head of a few of them – UBS, Allianz, Goldman Sachs Asset Management, Columbia Threadneedle, Schroders, SEI, Close Brothers and 7IM. 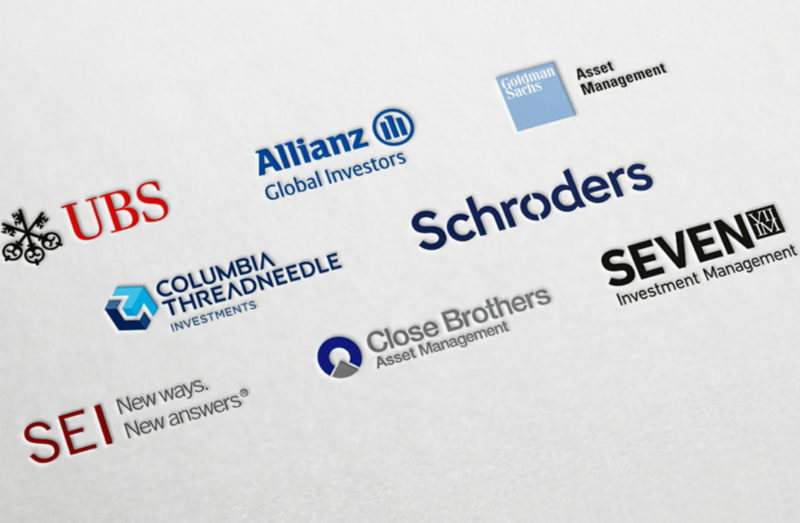 By partnering with these investing heavyweights, we gain access to 9,000 staff in 200 worldwide locations. This gives us a level of global diversification that aims to maximise your returns and reduce your risk. Investing with these major names through our Fully-Managed Investment Portfolios, at our low fee, represents excellent value for our customers. Let’s take a closer look at these fund managers, and the key people we are working with. UBS is a large-scale investment manager with a presence in 23 countries, offering a diverse range of traditional and alternative investment capabilities through informed advice, tailored ideas and best-in-class execution. There are 3,600 staff, and the company is the largest Swiss banking institution in the world. We work with Richard Lloyd, Global Head of Structured Solutions, part of the Global Investment Solutions team. Richard is responsible for the design, delivery and execution of a full range of structured and risk managed investment solutions. Allianz is a leading active investment manager with 25 offices in the US, Europe and Asia Pacific, providing global investment and research capabilities. The company is headquartered in Munich, Germany, and was founded in 1890. We work alongside Cordula Bauss, a Senior Portfolio Manager in the Multi Asset-Active Allocation team in Frankfurt. She manages multi asset funds and heads up the FX team, and started managing balanced portfolios in 2008. Founded in 1869, Goldman Sachs is based in Manhattan, New York. It is one of the world’s leading investment managers. David Copsey, vice president in the Global Portfolio Solutions (GPS) Group, assists with portfolio solutions for institutional and third party distribution clients. He is based in London and joined Goldman Sachs Asset Management in 2008. Richard Colwell Columbia Threadneedle in 2010 as a Portfolio Manager in the UK Equities team. He has research responsibility across all sectors. Headquartered in London, and founded in 1804, Schroders is a world-class asset manager with a unique global heritage of delivering innovative solutions to help institutions, intermediaries and individuals across the planet meet their goals, fulfil their ambitions, and prepare for the future. Heading the Multi-Manager team at Schroders is Marcus Brooks. He brings over 20 years’ investment experience to the team. SEI is an American investment management firm that helps professional wealth managers, institutional investors, investment management firms, and private investors create and manage wealth by providing innovative and comprehensive solutions that enable their long-term success. The head of the UK investment management unit is Jason Collins. He participates in all aspects of Portfolio management for the firm, including manager research and fund selection across all asset classes, asset allocation, portfolio construction and implementation. Riitta Hujanen joined Close Brothers Asset Management as Investment Director in July 2012. She previously held fund management positions at Schroders and Montanaro in London. Seven Investment Management is an investment management firm that helps professional intermediaries build their businesses and grow their assets through award-winning technology, great service and a common-sense approach. Having previously worked at Citigroup and Goldman Sachs, Ian Jensen-Humphreys joined 7IM in 2016 as a senior investment manager. He became Chief Investment Officer in November 2017. By partnering with all of these fund managers across the Fully-Managed Investment Portfolios which are managed by our in-house investment team, we have created globally diversified investments that could help you to reduce risk and maximise growth. Do more with your money, start your investment today.